An aquarium's pH is a measure of how acidic or alkaline the water is. A pH measure below 7.0 is considered acidic, 7.0 is neutral, and higher than 7.0 is alkaline. The pH value is important; most fish and other tank inhabitants do best in water that's as similar in constitution as possible to that of their natural habitat. Pet shops sell products that will raise aquarium pH, but you can also raise it effectively using a simple home remedy. The acceptable pH levels in an aquarium depend on what type of fish you have living there. Fluctuations are normal, so it’s unlikely that your tank water will arrive at the perfect pH and stay there -- but the levels should stay close. Some fish, such as freshwater tetras, prefer water that is slightly acidic with an optimal pH at or near 6.5. Other fish may require a much higher pH -- saltwater denizens do best with pH from 7.8 to 8.5. 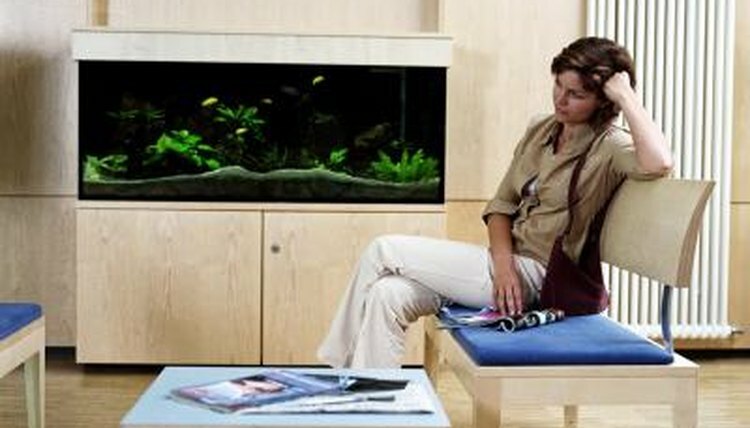 Making sudden changes to the water in your aquarium can be fatal to the inhabitants. If the new water is similar in pH, hardness and other qualities, the fish will most likely be fine, even if you replace a large volume of water. If the new water is significantly different from the old water, you can end up killing all of your fish, even if the new water should be better for them. Small changes of water are better than large changes in cases where the tank water hasn’t been changed in a long time or the makeup of the water is uncertain. Baking soda is a common home remedy to raise the pH in an aquarium. Baking soda will neutralize the acidic properties of the water in the tank and raise the pH. It’s best to make small adjustments with baking soda. The changes typically occur rapidly. According to aquarium expert Randy Holmes-Farley, adding baking soda is not the ideal method for making large changes to aquarium pH, but for most aquarists this product is close at hand and easy to use. Before adding baking soda to your fish tank, ensure the powder is dissolved completely, or it won't do any good. An easy way to do this is to measure out a small amount of baking soda, about three-quarters of a teaspoon for every 10 gallons of water. Dissolve the soda in a cup of tank water, then pour it back into your aquarium. Check the pH level an hour later. Repeat the procedure every day until the pH has risen to the desired level. FishChannelcom: Don’t Change That pH!